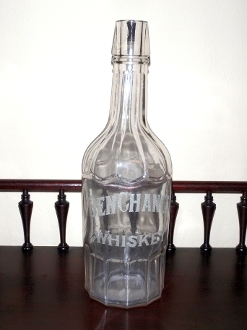 Ben Chance Whiskey back bar saloon bottle. Ben Chance was a race horse in the early 1900's. This bottle stands 11" with fluted base shoulder & neck. Has the typical air bubbles that are in glass from this time period. The raised lettering is of rough techture. Small hairline crack on lip of bottle hardly noticable. No chips on lip or base of bottle.